Unlike most stars, who wear their stardom and celebrity status on their sleeves, Varun Dhawan was never a fan of the perks of being a film maker's son. So much so that he used fake names in the past to hide his surname. Son of successful film maker David Dhawan, Varun, who made his Bollywood debut with the Karan Johar smash hit Student Of The Year, says he attended "several acting classes" using fake names. "I used to register myself with fake names like Rahul Khanna or something because I did not want my last name to be revealed," the 26-year-old said during the shooting of UTV Stars' show Breakfast To Dinner, pictures of which we have exclusively for you right here. 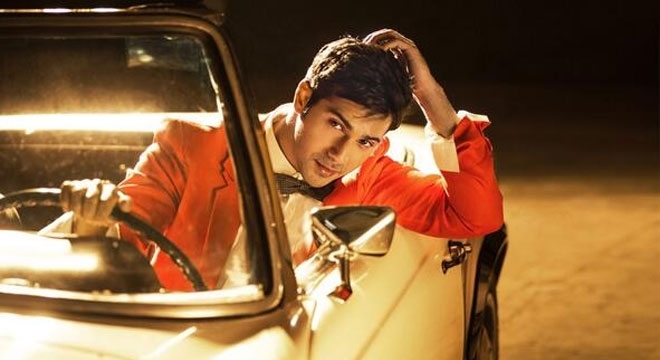 Varun will also be seen in dad's Main Tera Hero, which hits the marquee 4 April 2014. The film sees him opposite hotties Ileana D'Cruz and Nargis Fakhri and is produced by Ekta Kapoor. The episode of Breakfast To Dinner featuring Varun will air in India this Sunday 2 February.